A Eucalypt grown for the foliage, Eucalyptus cinerea is commonly known as the Argyle Apple. The foliage is a silvery green and it is the juvenile foliage that is sought after by florists as a backing material. This is a smaller to medium sized Eucalyptus with very attractive blue green foliage. It does respond well to hand pruning which makes it a versatile tree for smaller gardens. 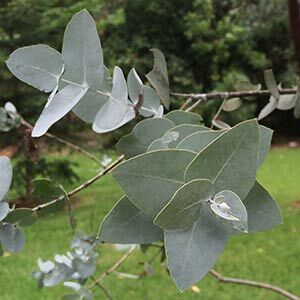 It is this rounded silvery foliage that give the tree another common name or ‘Silver Dollar Gum’. Excellent tree for smaller gardens and it will attract birds to the garden. The canopy is not overly dense, so it works well where a little filtered shade is required in the garden. The trunk is rough and with dark red fissured pattern, the bark is another attractive element. Growth habit is a little irregular, however formative pruning is possible. This ability to take regular pruning could lend Eucalyptus cinerea to being used as a hedging or screening plant. In fact in both New Zealand and in the USA Eucalyptus cinerea is used as a hedging plant. In these applications it is coppiced avery few years. Other species to consider for this purpose are E. saxitalis and E. nitens. Height – To 7m in cultivation, however taller in ideal conditions. Growth rate – Medium to fast depending on soil and climate and amount of sun. Drought tolerant – Reasonable to Good. The light coloured foliage reflects the sun, reducing water requirements. Coastal Conditions – No. Also not suited to saline or salt affected soils.